We Have More California Cats Purring Than Anyone. Schedule a Feline Behavior Wellness Consultation with our Veterinarian and Oxford-trained Certified Cat Behaviorist. Mieshelle Nagelschneider studied animal behavior and animal welfare at Oxford University and the University of Edinburgh – Royal School of Veterinary Studies, and is the author of the New York Times acclaimed feline behavior science book published in 4 languages by Random House Publishing. Founder and director of the clinic in 1999, her in-depth scientific analysis of the behavior and evolutionary biology of the cat has enabled her to help thousands of cat owners over two decades and in 30 different countries, solve their cat’s behavior issues. Read 268 + solved case study reviews and client testimonials. Recipient of the Golden Purr Award for her contribution to cat behavior, you can learn more about her other animal studies including her experience at Harvard University (here) that has enabled her to assess and effectively solve cat behavior issues. Our Veterinarian Dr. Jim Shultz performs local in-home consultations only. She is known for her global leadership in cat behavior education. Her passion and curiosity about cats along with her formal study in animal behavior, continues to put her on the forefront of cat behavior knowledge crossing the conventional boundaries of the cat behavior specialty. Dr Shultz DVM performs in-home consultations locally only where he is licensed to practice. Mieshelle performs consultations world-wide either remotely by phone or video or in-person (yes, she travels). Read 268 Testimonials and Solved Case Study Reviews Here. Please contact the clinic to schedule a phone or video (Skype or Facetime) behavior consultation. Please visit our home page to begin. Cat Behaviorist Mieshelle Nagelschneider goes beyond the obvious behavior strategies and facts during behavior consultation program. She has lectured at the international level from Australia to the Philippines at education conventions for veterinarians, the Humane Society/SPCA on all common, but sometimes very complex, feline behavior issues. For over two decades, California cat behaviorist Mieshelle Nagelschneider, has conducted several thousand cat behavior consultations in over 30 countries. Dr. Shultz DVM performs cat behavior consultations locally in the cat’s home. Behavior consultations are conducted locally, by phone or Skype video in California. In-person consultations in California are taken on a case by case basis. Her award-winning first ever scholarly-cited cat behavior book (Random House Publishing) for cat owners published in 4 languages and across 80 countries (with co-writer Cameron Powell) featured in The New York Times and is recommended text for a number of animal behavior certifying organizations. Read more about Mieshelle’s national and international media, animal welfare and spokesperson work on the clinic about page. Watch Mieshelle with Howie Mandel on National Geographic’s Animals Doing Things and also, The Wild Side of Cats and on the Today Show, Nat Geo Wild, Animal Planet, Hallmark Channel (and countless others) and her work with Best Friend’s Animal Society, the SPCA, and in Los Angeles for the NKLA. Call the clinic today to learn more or to schedule your consultation at 503-267-8888. 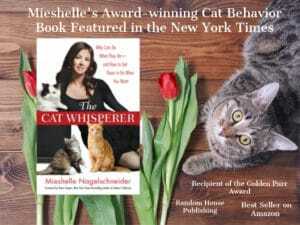 Mieshelle’s New York Times Acclaimed cat behavior science Book, The Cat Whisperer™ (Random House Publishing) is Best Selling on Amazon in Animal Psychology for Cat Behavior. “‘Purrfect’ Match: ‘Cat Whisperer’ Mieshelle Nagelschneider & ‘Cat Daddy’ Jackson Galaxy Join Forces for Stray Cat Alliance – News Watch”. Newswatch.nationalgeographic.com. 2013-10-01. “Cat Behaviorist Mieshelle Nagelschneider and NKLA Adoption Weekend Saves Nearly 400 L.A. Shelter Pets”. Topanga Messenger. 2013-11-28. Archived from the original on 2013-12-16.